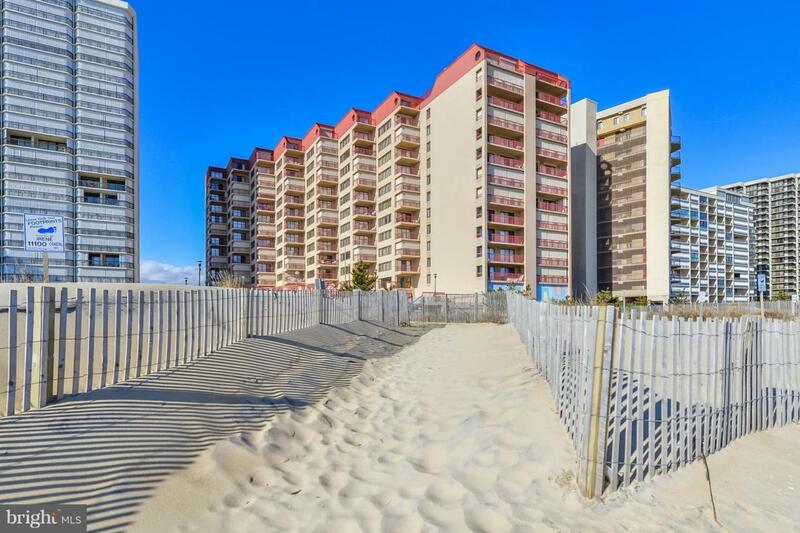 Exceptional Ocean City Resort Investment Condo, potential for $41,000 Gross Rental Income, now booking for 2019 Season. West corner location with due-East ocean view, complimented by panoramic year-round City Lights and Bay views, enjoying both SunRises and SunSets . Quality appointments, tastefully updated, over-sized 1-Bedroom unit reconfigured to add the Den. Private gated covered Veranda with storm shutters provides added outdoor living space with Bay view, relaxing seating area for afternoon reading, crab-picking picnic table for family fun. Full-sized Laundry a must, quieter concrete between units, central fire alarm system. 10th floor of 11, 9th tier is handy to stairway, West elevator, trash chute, no foot traffic past this condo. Grand Hi-Rise with superior In-House Management and Maintenance, In-House Rentals available, Seasonal Lot Guard, heated outdoor pool + youth pool, 1 assigned parking space, bike storage, 2 high speed elevators, large sun deck with Summer beach chairs, flood insurance and premium cable in condo fee @ $393/m, RE Taxes @ 267/m. Pre-inspected + 1-year enhanced Home Warranty. No assessments in 10+ years, $500,000+ in Reserve Account, new generator to be installed at no cost to owners. Additional Guest parking available as occupancy permits. When making your buying decision, consider the added value of this strong and active Association protecting your Investment.